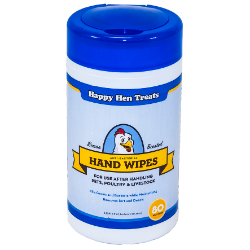 Happy Hen Treats Anti Bacterial Hand Wipes are ideal for using after handling your pets, poultry, or livestock when soap and water are not available. Remove debris and soil from hands whiles killing germs and bacteria. Fresh Lemon Scent. Moisturizes and kills bacteria. Pull one sheet from canister. Clean hands or affected area and discard. Close canister after each use to keep wipes fresh.